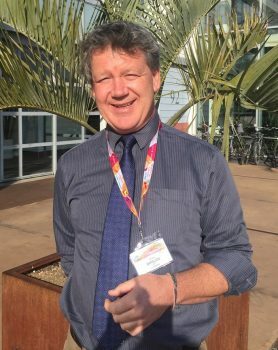 Editor’s note: This post was contributed by Craig Donlon, who will join us at ESOC in Darmstadt next week for #Sentinel2Go. I love satellite launch days and it’s going to be a very special and exciting night at the #Sentinel2Go event. We will all witness together the launch of the second Copernicus Sentinel-2 satellite – bringing us twice the amount of crystal-clear and intricate images of our planet and its amazing coastal and ocean environments. All being well after separation and signal acquisition, we will be a happy bunch celebrating success! I have one of the best jobs in the world working as a mission scientist and oceanographer at ESA’s ESTEC centre in The Netherlands. It means I get to work together with the ESA project engineering teams that design, build, launch and commission each of our satellites. I also work closely with our ground segment teams and the Sentinel-2 mission manager at ESA’s ESRIN centre in Italy, who operate Sentinel-2 on a day-to-day basis. They make sure that we all get the data we need. It’s a joy to work together with the brilliant scientists from all over Europe and the world to provide advice and critical inputs to make sure we get the best out of our satellite missions through design to operational decisions, so that we can all benefit from the beauty of our planet seen through our special ‘eyes in space’. As our experience grows using Sentinel-2 for coastal and marine environment applications, we are able to improve Sentinel-2 products and services to better serve Copernicus and the brilliant science that is required to make Copernicus great: the science of today is the operational applications of tomorrow. What do I do in my spare time? (What spare time!) When I can, I spend time with my family and my beehives in Devon, UK and occasionally build a vintage guitar valve amplifier to make a lot of noise with my electric guitars. Can’t wait for the launch – see you there!